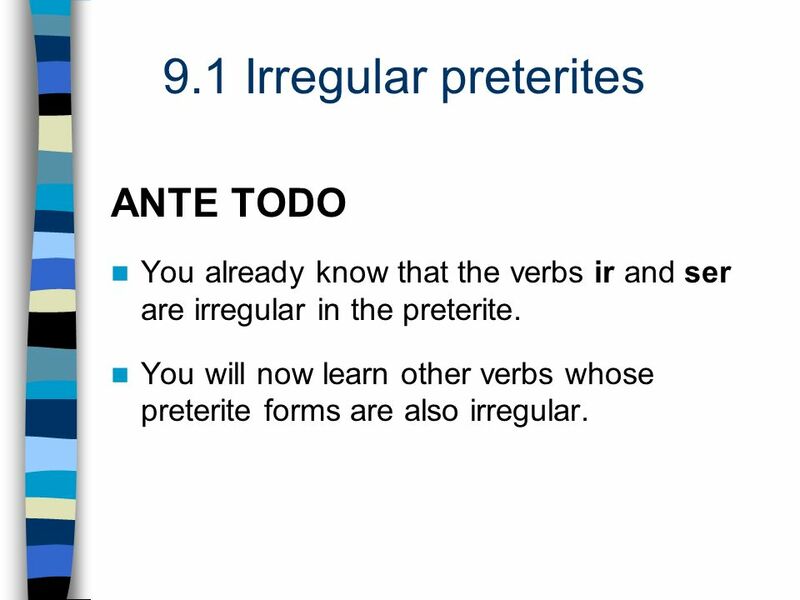 1 ANTE TODO You already know that the verbs ir and ser are irregular in the preterite. 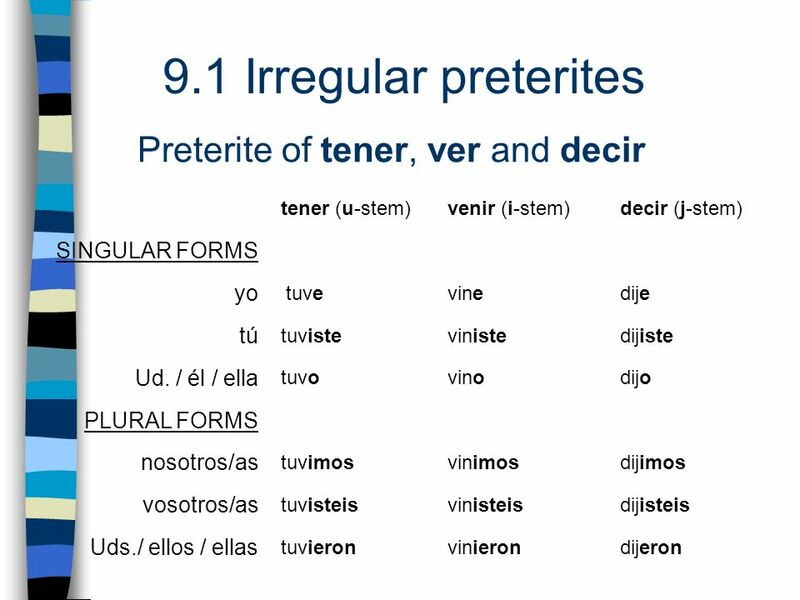 You will now learn other verbs whose preterite forms are also irregular. 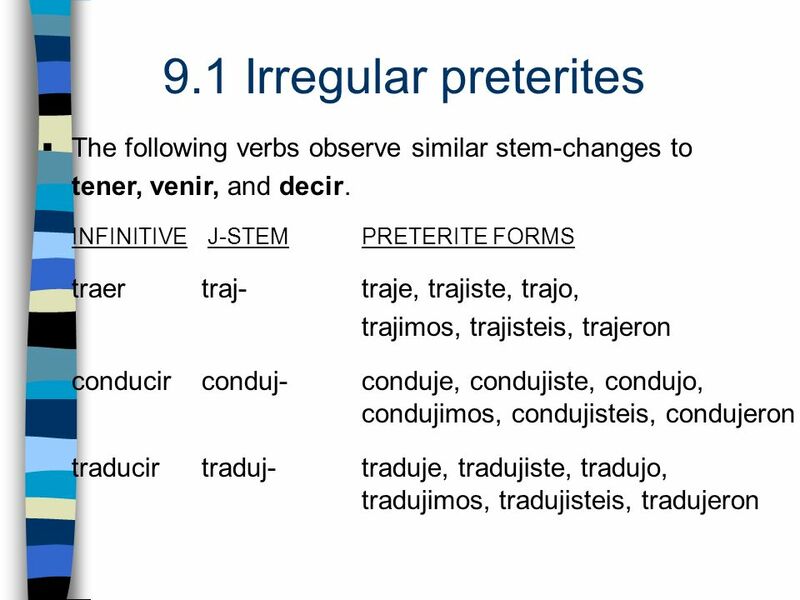 3 The following verbs observe similar stem-changes to tener, venir, and decir. 6 ¡ATENCIÓN! 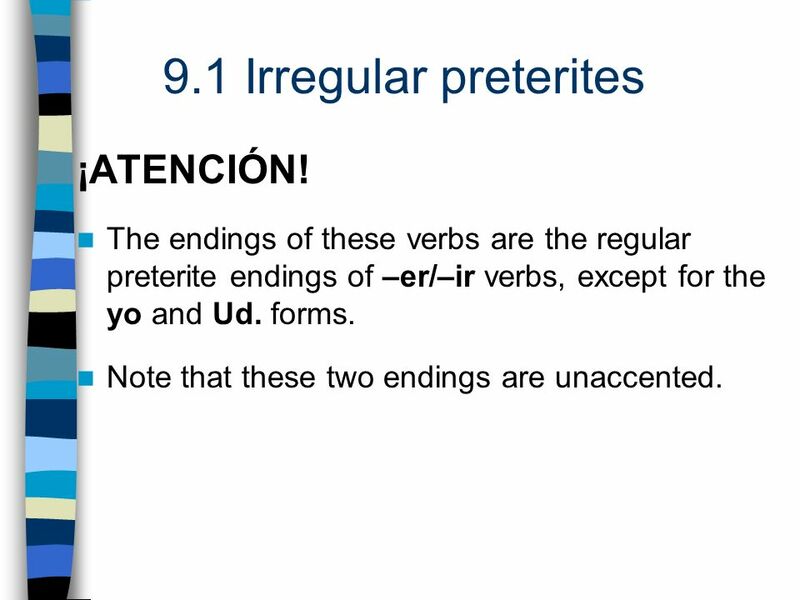 The endings of these verbs are the regular preterite endings of –er/–ir verbs, except for the yo and Ud. forms. Note that these two endings are unaccented. 7 ¡ATENCIÓN! 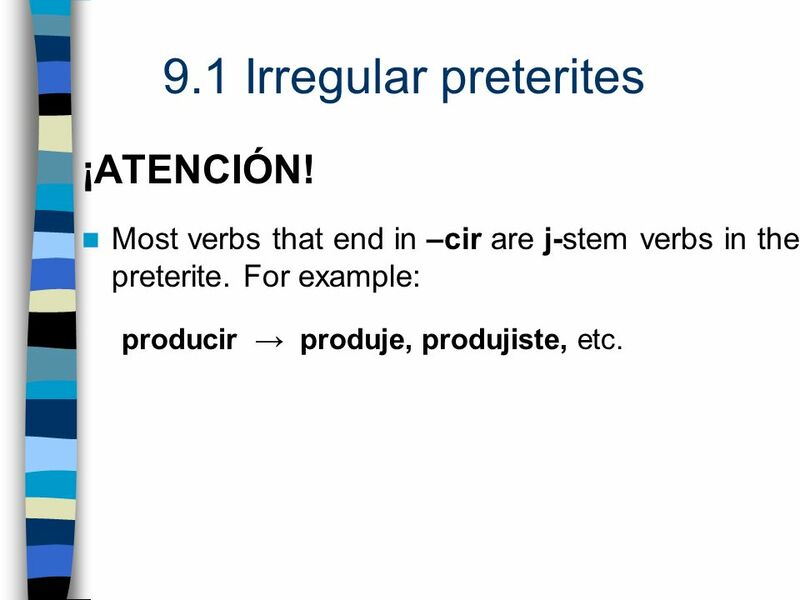 Most verbs that end in –cir are j-stem verbs in the preterite. For example: producir → produje, produjiste, etc. 8 Mis amigos trajeron comida a la fiesta. 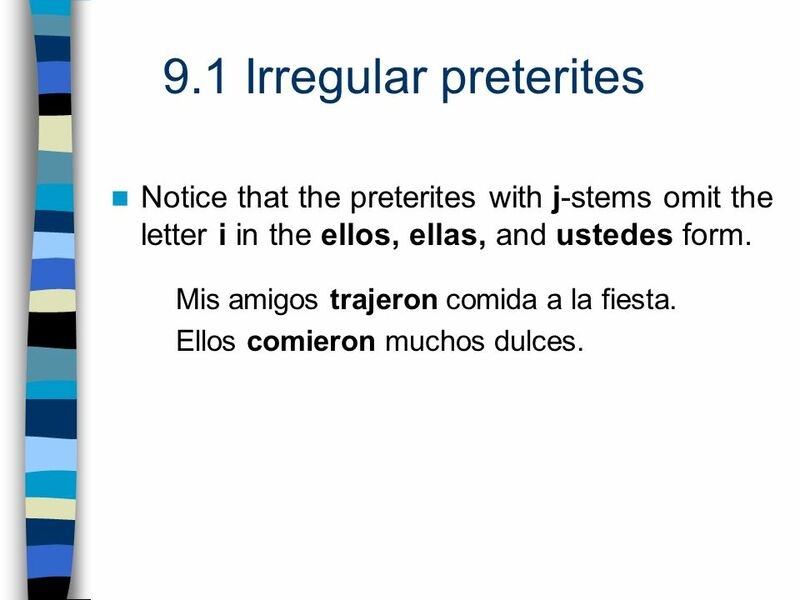 Notice that the preterites with j-stems omit the letter i in the ellos, ellas, and ustedes form. Mis amigos trajeron comida a la fiesta. Ellos comieron muchos dulces. 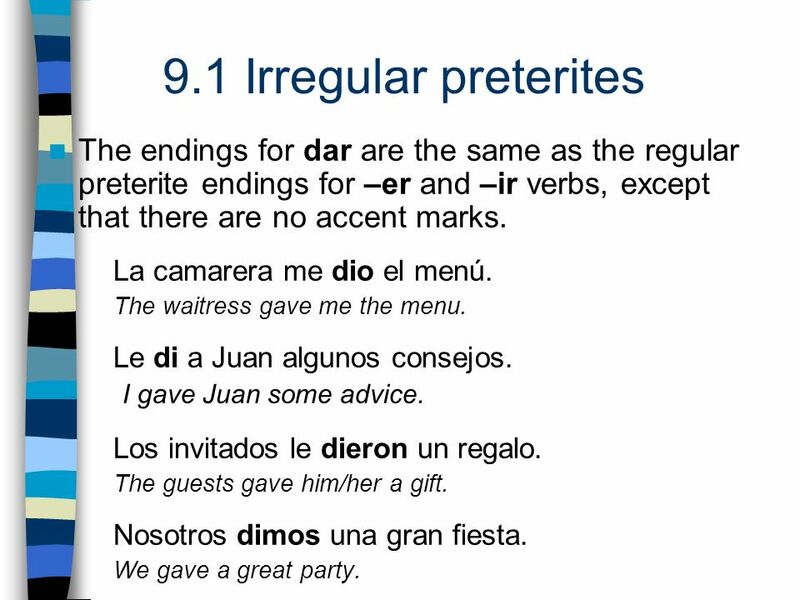 10 The endings for dar are the same as the regular preterite endings for –er and –ir verbs, except that there are no accent marks. La camarera me dio el menú. The waitress gave me the menu. Le di a Juan algunos consejos. I gave Juan some advice. Los invitados le dieron un regalo. The guests gave him/her a gift. Nosotros dimos una gran fiesta. We gave a great party. 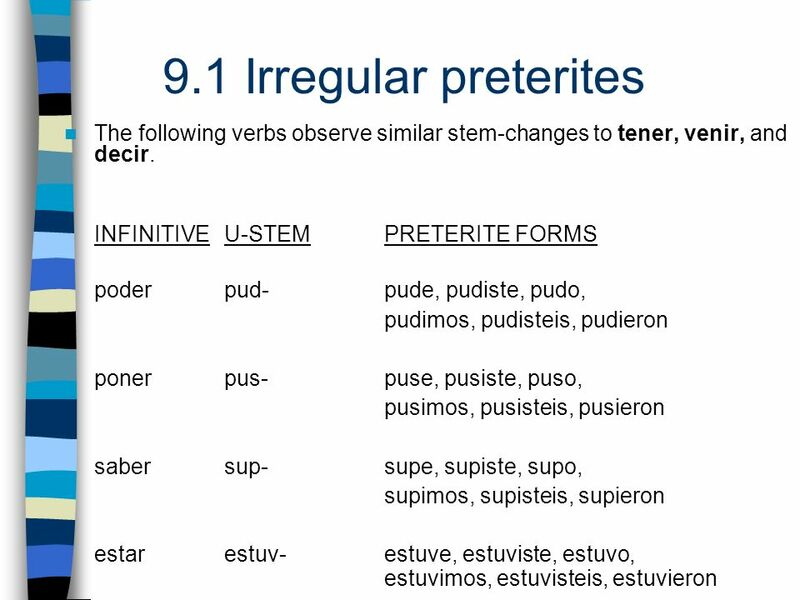 Descargar ppt "ANTE TODO You already know that the verbs ir and ser are irregular in the preterite. 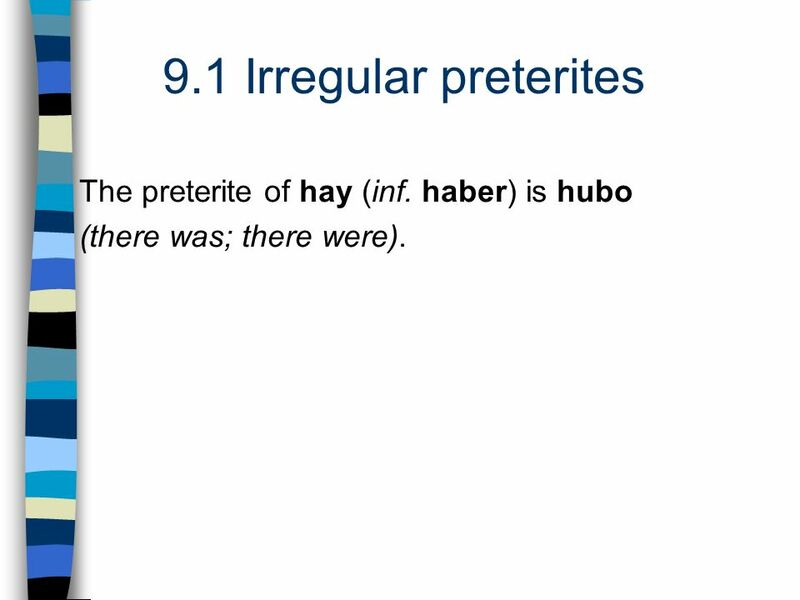 You will now learn other verbs whose preterite forms are also irregular." 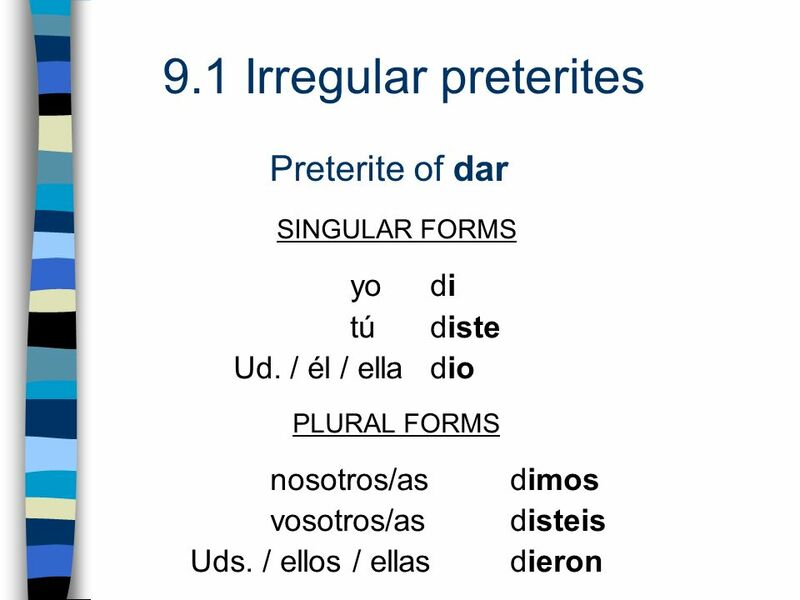 Irregular Preterite There are several irregular verbs in the preterite. In this presentation, well take a look at the most important ones. 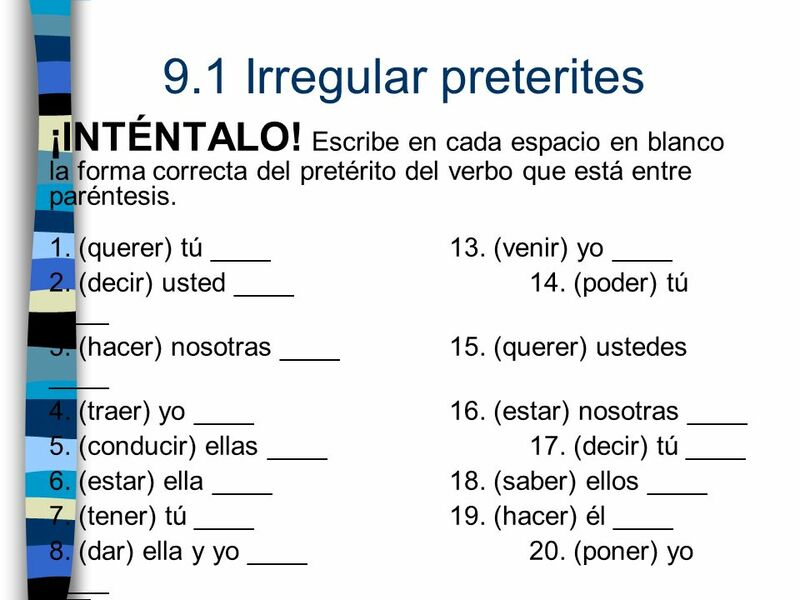 PRETERITe BOWL 2011!. Conjugate! 1.Marcar (Ud.) 2.Tener (ellos) 3.Jugar (yo) 4.Hablar (nosotros) 1.Marcó 2.Tuvieron 3.Jugué 4.Hablamos 2. 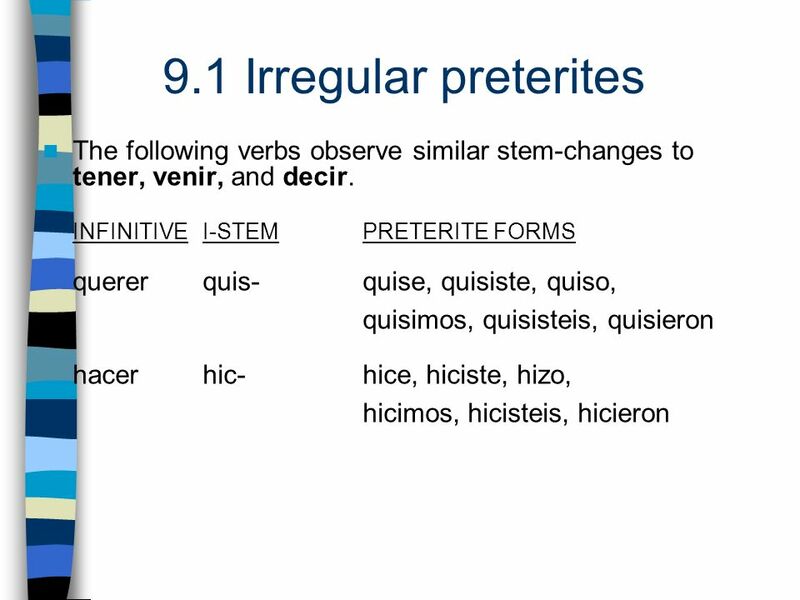 Irregular Preterite Verbs Esp. 2 Realidades 1 -AR Preterite Endings é aste ó amos asteis aron.